I did spend a bit of time on Sunday tidying up my main hobby painting desk and re-arranging my paints back into some semblance of order. The painting desk had become a right mess, and it was becoming both annoying working at the desk, but also hard to get going and find the paints I wanted to use. There’s still more work to be done in that regard (the spray booth has at the moment piles of boxes, miniatures and paints in it), and the second desk is still a mess, but it’s heading in a better direction. 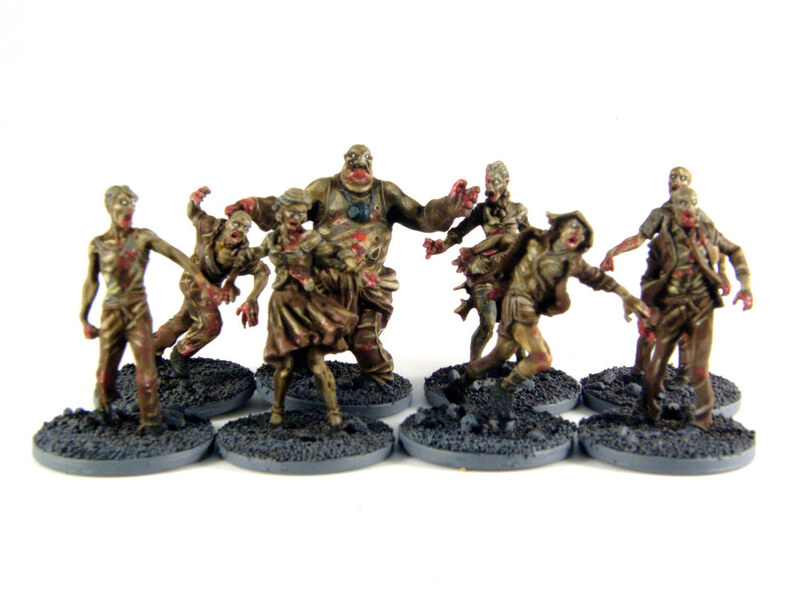 This doesn’t mean that I’ve made a massive amount of progress on anything particularly, but having completed the box of the “Walk of the Dead Expansion #1” from Zombicide, my main focus was to look at completing more Zombicide zombies; this time from the season one box game. I did some bulk undercoating at the beginning of the new year with my airbrush of all the zombies in the Zombicide season 1 box game. That’s a total of 64 zombies (not including the 28 I’d already painted from the expansion box). I did the undercoating in two batches of 32, which is the most number of individual models I’ve tried to undercoat in one go ever. In truth, it was too many, as this particular batch had parts I’d missed, which meant the first step was to make sure the entire model was covered in primer via a brush, which I did early in the week. That was pretty frustrating, and I was irritated with myself for not checking I’d undercoated them properly at the time. With completing the season one set of Zombicide being one of my main hobby goals this year, I’m making a conscious effort to focus on these over anything else, so other model work has taken a bit of a back seat. 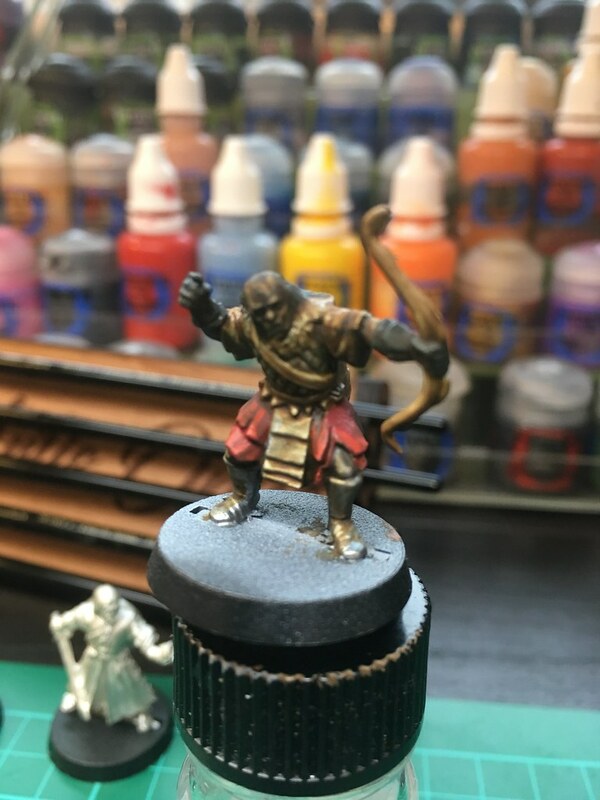 I stripped back my painting style for this particular group to focus on speed. Unfortunately my colour choice for these models was poor; I chose brown trousers and skirts and grey shirts and tops, which along with the very pale Rakarth Flesh dead skin tone didn’t offer very much contrast. Once the overall wash was applied (which is the critical step for the speed painting approach I’m taking), the difference between the various areas on the model became too subtle for my taste. Regardless, I don’t think they’ve come out terribly (I think the blood and eerie white eyes adds some interest), but they were quick to do and once combined with the rest of the zombie horde, they’ll fit in quite nicely. With good progress made on the Zombicide zombies, I treated myself to another quick set of models rather than starting another batch. I have a few models undercoated ready to work on (two Goliath Gangers, a pack of Blood Claws to work on for instance), however, what tickled my fancy at the weekend was a couple of Mordor Orcs I had on the painting table. I’ve tried to limit myself to the same colours, but applied them, in different areas on the model. They mostly fit in with the two other Mordor Orc archers I’ve already completed. 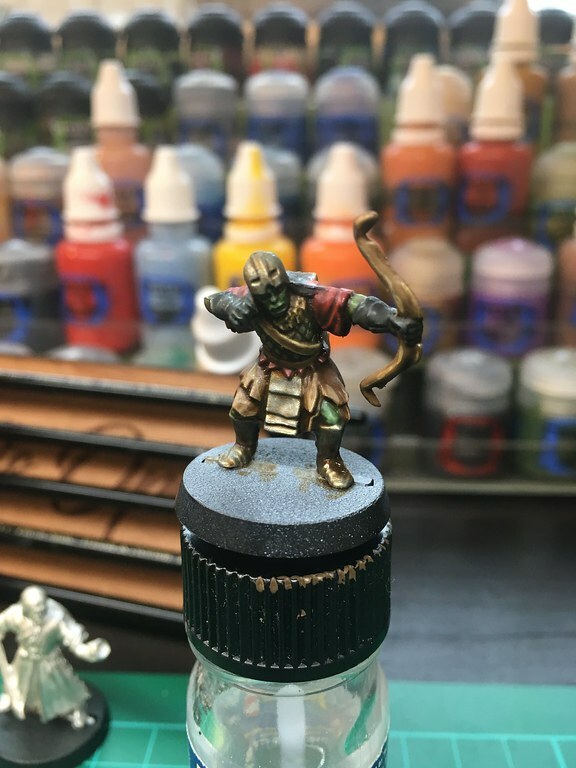 Nothing spectacular here, just a quick paint job – and yes, that is Boromir keeping a close eye on the growing Orc horde! I know, I still can’t take an in-focus photo with my iPhone! I’ve been posting regular WIP photographs of the miniatures I’ve been painting over on Instagram (follow me at @droidworkshop), and I know have over 100 followers, which I’m quite pleased about. I’m regularly getting 20+ likes on posts, which is also pleasing. Twitter has not been successful in comparison, and I’m finding that I don’t really drum up much interest. I suspect with Twitter actively commenting and entering into discussions increases interaction with your own posts. Although I’ll continue, I find that Instagram is helping me far more with motivation. I’ve been doing quite a bit of work since Friday evening on creating a new design for this website. It’s been quite heavy going for me as I’m definitely no web designer, however once I’ve got the design in place, making the development changes should be a breeze for me.